This is a great soup you can make with your leftover turkey (or chicken) carcass. The long cooking process allows all the great nutrients to get pulled out of the bones, and being a soup, you can throw in all kinds of vegetables to clear up your fridge or to use up last night’s leftover sauteed veggies. For this soup, we also added 2 parsnips, chopped; 1 bunch of kale with the stems removed; and 2 leeks, chopped. Turnips and string beans are also a great addition plus any herbs of your choice. After a turkey dinner night, we save the carcass to make this soup. All you need to do is put the carcass in a large pot over the stove adding 8-10 cups water (or turkey broth you made previously from the gizzards, see below) and cover. Let this cook on medium-low heat for a few hours throughout the day. If the water/broth gets too low, add more throughout the cooking process. Once the turkey has cooked for several hours, turn the flame off to allow it to cool. Once cooled, take the turkey out and de-bone it (basically getting all the good meat off to put back in the soup and leaving the bones behind). After you are done putting the good meat back into the soup, get ready to add all your chopped vegetables. 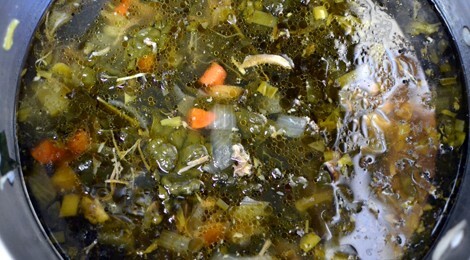 You can add any kinds of root veggies or dark greens to really help this soup build depth. Salt and pepper to taste. Once you add all your vegetables, cover and let cook for a few more hours on low or until veggies are tender and smelling delicious. Taste and add salt if needed. When you first unpack your turkey, inside are a bunch of organs. Make sure you get those out before cooking the bird, and sometime they are covered in paper so be sure to remove that as well. Once you do, simply put all the gizzards into a smaller pot, and cover with water. Cook for a few hours, and you will have some turkey broth to add to your soup. Leave the organs behind, and give to your animals; they’ll love it!